This is the second novel I read by author Jordi Díez after really enjoying Virgin of the Sun. 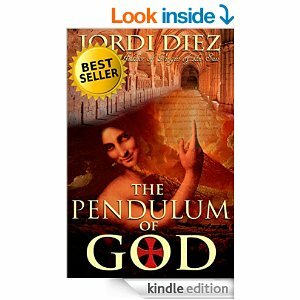 The plots are quite different and in many ways The Pendulum of God is a much more complicated story. Although the main action takes place in the here and now (well, a few years back), there are segments of the story that happen in the early Christian era, others in the Middle Ages (XIII Century), in the XVIII Century and even during WWII. And the settings also take us from Barcelona to Paris, Romania, Switzerland, San Sebastián, Israel and many other places in between. There is intrigue, conspiracy theories, the search for a secret document that two enemy sides have been after for centuries, goodies that are not always as good as they seem to be, baddies who are sometimes worse than anybody would give them credit for, secret identities, crimes, miracles, games of cat and mouse, follow the clues, historical facts and flights of fancy, love and betrayal…The Pendulum of God is a great adventure, that quickens its pace the further the plot advances and you’ll find difficult to stop reading. I also found connections with Virgin of the Sun because the main character, Cécil, experiments a profound change during his journey. From the rationality and adherence to facts that are part and parcel of his job as an auditor, he sees his cynical stance challenged by communities and beliefs whose life style and assumptions are completely outside of his comfort zone. Many extraordinary things happen in this book, but the evolution of its protagonist is, in many ways, the most extraordinary of all. If you enjoy following clues, mysteries and adventures, you’ll enjoy this book. If you like to explore historical eras and facts from the past, you’ll find much to occupy your mind. If you’ve always wondered how far you would go to change your life, this book might make you think again. I will follow the author with interest and hope there will be more novels soon. I hope you enjoy it. Jordi is a great writer and a thoroughly nice guy.